A division of astronomical objects between rocky objects, liquid objects, gaseous objects (including gas giants and stars), and plasma objects may be natural and informative. The astronomy of such gaseous objects may be called gaseous-object astronomy. The surface of the Sun emits in the red (621 to 750 nm) wavelengths. "Turbines have been around for a long time—windmills and water wheels are early examples. The name comes from the Latin turbo, meaning vortex, and thus the defining property of a turbine is that a fluid or gas turns the blades of a rotor, which is attached to a shaft that can perform useful work." Def. astronomy that studies gaseous objects is called gaseous-object astronomy. Def. any physical or material thing, entity, or substance is called a body. Gaseous objects have at least one chemical element or compound present in the gaseous state. These gaseous components make up at least 50 % of the detectable portion of the gaseous object. The familiar red H-alpha [Hα 656 nm] spectral line of hydrogen gas, which is the transition from the shell n = 3 to the Balmer series shell n = 2, is one of the conspicuous colors of the universe. It contributes a bright red line to the spectra of emission or ionization nebula, like the Orion Nebula, which are often H II regions found in star forming regions. In true-color pictures, these nebula have a distinctly pink color from the combination of visible Balmer lines that hydrogen emits. A "high-resolution spectrum of the Becklin-Neugebauer (BN) infrared point source located in [the region of the Orion Nebula] ... with the Steward Observatory 2.29 m (90 inch) telescope ... [confirmed] the reality of [the 2.12 μ] line ... on 1976 January 15 and 16. The line was then identified by R. Treffers as the S(1) line of the 1-0 vibration-rotation quadrupole spectrum of H2. Six other lines of the same band were also found. The presence of two of our lines has been confirmed by Grasdalen and Joyce (1976). Electronic transitions of interstellar H2 have previously been observed in the ultraviolet (Carruthers 1970; Smith 1973; Spitzer et al. 1973)." "[H]igh-resolution spectral measurements of Mercury show emission in sodium D lines (Potter and Morgan 1985a). This suggests a substantial sodium population in Mercury's atmosphere ... possibly due to photo-sputtering of the planetary surface". At least in emission yellow astronomy, Mercury is a dwarf gaseous object. Venus has been detected as a gaseous object using X-ray through red astronomy. 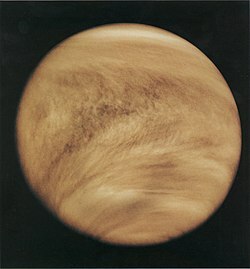 When imaged in visible light (upper left) Venus appears like a gas dwarf rather than a rocky body. The same image result occurs when it is viewed in the ultraviolet (right). 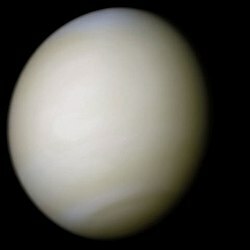 When Venus is viewed by radiation astronomy in addition to ultraviolet astronomy and visual astronomy, it is discovered to have a rocky interior suggesting that it is better understood and studied from the perspective of planetary science as a rocky object. The Earth's atmosphere is a relatively bright source of gamma rays produced in interactions of ordinary cosmic ray protons with air atoms. In gamma-ray and X-ray astronomy, Earth is a dwarf gaseous object. On July 4, 2001, this Chandra X-ray Observatory image became the first look at X-rays from Mars. Credit: NASA/CXC/MPE/K.Dennerl et al. From the point of view of X-ray astronomy, Mars is a dwarf gaseous object. At right is an X-ray image of Mars. X-radiation from the Sun excites oxygen atoms in the Martian upper atmosphere, about 120 km above its surface, to emit X-ray fluorescence. A faint X-ray halo that extends out to 7,000 km above the surface of Mars has also been found. The Chandra X-ray Observatory image on the right is the first look at X-rays from Mars. In X-ray astronomy, Mars is a gas dwarf. "Four hydrogen (H2) lines have been detected in a spectrum of Mars observed with the Far Ultraviolet Spectroscopic Explorer. ... The line intensities correspond to [an] H2 abundance ... above 140 kilometers on Mars. ... Analysis of [deuterium] fractionation among a few reservoirs of ice, water vapor, and molecular hydrogen on Mars implies that a global ocean more than 30 meters deep was lost since the end of hydrodynamic escape. Only 4% of the initially accreted water remained on the planet at the end of hydrodynamic escape, and initially Mars could have had even more water (as a proportion of mass) than Earth." Cloud bands are clearly visible on Jupiter. Credit: NASA/JPL/USGS. Jupiter is a larger gaseous object in X-ray and ultraviolet astronomy. Jupiter is seen as a gaseous object in orange, red and infrared astronomy. Green astronomy indicates Io is a dwarf gaseous object. The planet Saturn is seen in approximate natural color by the Hubble Space Telescope. Credit: . Saturn is a larger gaseous object from X-ray and ultraviolet astronomy. Saturn is a gas giant. In orange astronomy, Titan is a gaseous object. Titan has a mean radius of 2576 ± 2 km. A 1998 false-colour near-infrared image of Uranus showing cloud bands, rings, and moons obtained by the Hubble Space Telescope's [Near Infrared Camera and Multi-Object Spectrometer] NICMOS camera. Credit: Hubble Space Telescope - NASA Marshall Space Flight Center. In optical and visual astronomy, Uranus is a gaseous object in orbit around the Sun. "Uranus's atmosphere [has a] primary composition of hydrogen and helium [and] contains more "ices" such as water, ammonia, and methane, along with traces of hydrocarbons. ... The helium molar fraction, i.e. the number of helium atoms per molecule of gas, is 0.15 ± 0.03 in the upper troposphere, which corresponds to a mass fraction 0.26 ± 0.05. ... The third most abundant constituent of the Uranian atmosphere is methane (CH4). ... Methane molecules account for 2.3% of the atmosphere by molar fraction below the methane cloud deck at the pressure level of 1.3 bar (130 kPa); this represents about 20 to 30 times the carbon abundance found in the Sun. The mixing ratio is much lower in the upper atmosphere owing to its extremely low temperature, which lowers the saturation level and causes excess methane to freeze out. The abundances of less volatile compounds such as ammonia, water and hydrogen sulfide in the deep atmosphere are poorly known. ... Along with methane, trace amounts of various hydrocarbons are found in the stratosphere of Uranus, which are thought to be produced from methane by photolysis induced by the solar ultraviolet (UV) radiation. They include ethane (C2H6), acetylene (C2H2), methylacetylene (CH3C2H), and diacetylene (C2HC2H). Spectroscopy has also uncovered traces of water vapor, carbon monoxide and carbon dioxide in the upper atmosphere, which can only originate from an external source such as infalling dust and comets." 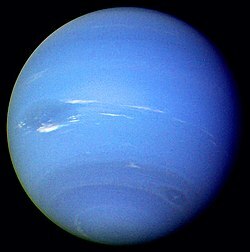 In optical and visual astronomy, Neptune is a gaseous-object in orbit around the Sun. Cyan and green astronomy demonstrate that many comets are dwarf gaseous objects. A gas detector is a device which detects the presence of various gases within an area or volume. The combination of nanotechnology and microelectromechanical systems (MEMS) technology allows the production of a hydrogen microsensor that functions properly at room temperature. One type of MEMS-based hydrogen sensor is coated with a film consisting of nanostructured indium(III) oxide (In2O3) and tin oxide (SnO2). A typical configuration for mechanical Pd-based hydrogen sensors is the usage of a free-standing cantilever that is coated with Pd. In the presence of H2, the Pd layer expands and thereby induces a stress that causes the cantilever to bend. Pd-coated nano-mechanical resonators have also been reported in literature, relying on the stress-induced mechanical resonance frequency shift caused by the presence of H2 gas. In this case, the response speed was enhanced through the use of a very thin layer of Pd (20 nm). Moderate heating was presented as a solution to the response impairment observed in humid conditions. Gaseous objects have a discernable shape. ↑ gas. San Francisco, California: Wikimedia Foundation, Inc. September 19, 2013. Retrieved 2013-10-05. ↑ Lee S. Langston (July-August 2013). "The Adaptable Gas Turbine". American Scientist. http://www.americanscientist.org/issues/pub/2013/4/the-adaptable-gas-turbine. Retrieved 2013-10-05. ↑ gaseous. San Francisco, California: Wikimedia Foundation, Inc. September 29, 2013. Retrieved 2013-10-05. ↑ File:Venus xray 420.jpg. San Francisco, California: Wikimedia Foundation, Inc. October 28, 2010. Retrieved 2012-08-08. ↑ T. N. Gautier II and Uwe Fink, Richard R. Treffers, and Harold P. Larson (July 15, 1976). "Detection of Molecular Hydrogen Quadrupole Emission in the Orion Nebula". The Astrophysical Journal 207 (07): L129-33. doi:10.1086/182195. http://adsabs.harvard.edu/full/1976ApJ...207L.129G. Retrieved 2013-10-05. ↑ K. Dennerl (November 2002). "Discovery of X-rays from Mars with Chandra". Astronomy & Astrophysics 394 (11): 1119-28. doi:10.1051/0004-6361:20021116. ↑ Vladimir A. Krasnopolsky, Paul D. Feldman (November 2001). "Detection of Molecular Hydrogen in the Atmosphere of Mars". Science 294 (5548): 1914-7. doi:10.1126/science.1065569. http://www.sciencemag.org/content/294/5548/1914.short. Retrieved 2013-10-05. ↑ Sue Lavoie (October 13, 1998). PIA01637: Io's Aurorae. Pasadena, California: NASA and the Jet Propulsion Laboratory, California Institute of Technology. Retrieved 2012-07-22. ↑ R. A. Jacobson, P.G. Anreasian, J.J. Bordi, K.E. Criddle, R. Ionasescu, J.B. Jones, R. A. MacKenzie, M.C. Meek, D. Parcher (December 2006). "The Gravity Field of the Saturnian System from Satellite Observations and Spacecraft Tracking Data". The Astronomical Journal 132 (6): 2520-6. doi:10.1086/508812. http://iopscience.iop.org/1538-3881/132/6/2520/fulltext. Retrieved 2012-07-08. ↑ 16.0 16.1 16.2 16.3 Jonathan I. Lunine. "The Atmospheres of Uranus and Neptune". Annual Review of Astronomy and Astrophysics 31: 217–63 1993. doi:10.1146/annurev.aa.31.090193.001245. ↑ Tyler, J.L. ; Sweetnam, D.N. ; Anderson, J.D. ; Campbell, J. K.; Eshleman, V. R.; Hinson, D. P.; Levy, G. S.; Lindal, G. F. et al. (1986). "Voyger 2 Radio Science Observations of the Uranian System: Atmosphere, Rings, and Satellites". Science 233 (4759): 79–84. doi:10.1126/science.233.4759.79. PMID 17812893. ↑ "Uranus". Wikipedia (San Francisco, California: Wikimedia Foundation, Inc). July 8, 2012. http://en.wikipedia.org/wiki/Uranus. Retrieved 2012-07-08. ↑ Crisp, D., Hammel, H. B. (14 June 1995). Hubble Space Telescope Observations of Neptune. Hubble News Center. Retrieved 22 April 2007. ↑ Gustavo Alverio. A Nanoparticle-based Hydrogen Microsensor. University of Central Florida. Retrieved 2008-10-21. ↑ D.R. Baselt. "Design and performance of a microcantilever-based hydrogen sensor". Sensors and Actuators B. ↑ Sumio Okuyama. Hydrogen Gas Sensing Using a Pd-Coated Cantilever. Japanese Journal of Applied Physics. http://jjap.jsap.jp/link?JJAP/39/3584/. Retrieved 2013-02-26. ↑ Jonas Henriksson. "Ultra-low power hydrogen sensing based on a palladium-coated nanomechanical beam resonator". Nanoscale Journal.